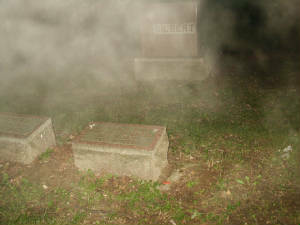 Visit our "INVESTIGATIONS" pages to see more information and photos. Our 2007 & 2008 investigations are being updated, so check back often. Dont forget to email us if you have questions or ideas about these experiences! PLEASE CHECK BACK WITH US AS WE POST NEW IMAGES! 5 of 6 photos were fine, this (3rd) pic is misty. Same place, in back corner. Cant see it with naked eyes. Unretouched photo. 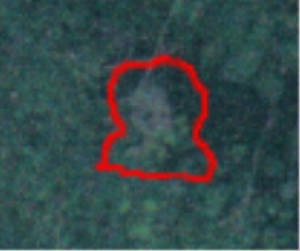 See our "investigations page for more on this black shadow figure. 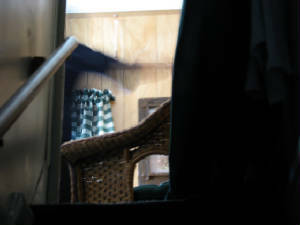 It appeared in the daytime, in a series of 4 photos taken one right after the other (continuous shot) over the span of about 20 seconds at most. 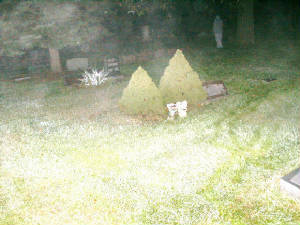 The photos were taken in a pre-ivestigation walkthrough and the shadowy figures were not seen again that night. 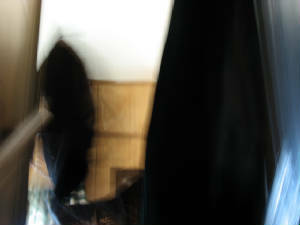 The first photo had the swirling image below. The second photo had the image above, and the next two had no shadow image. Note the placement of light and furniture and objects. Mist in pic. Cemetery did not seem to active though. 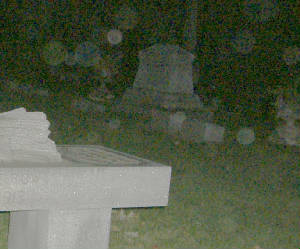 Many possible orbs, but look to the right of picture...what do you see?